I previously read this book in high school for a novel study in ELA. I don't often do re-reads but, since I read this one so long ago, I requested the audiobook when I saw it on my library's Overdrive. The Curtis boys are orphans. Their parents were killed in a car accident, leaving the oldest son Darry (20 years old) to take care of his younger brothers (16 year old Soda and 14 year old Ponyboy). The Curtis' and their friends are known as Greasers, with their slicked back longer hair. They are lower class to the Socs or Socialites, who are the rich kids. One evening, Ponyboy is walking home from a movie when he gets jumped by a group of Socs. His brothers and friends come to his rescue, scaring off the Socs. 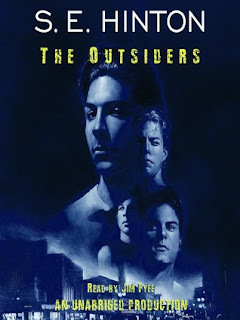 The following evening, Ponyboy returns to the movie theatre with a couple of his buddies. They meet some girls, who are Socs. While walking the girls home, they run into the girls' boyfriends who want to pick a fight with the boys. The next night, the Socs get their chance to get back at Ponyboy and Johnny. When Johnny kills one of the Socs in self-defense, the Socs vow to get their revenge and Johnny and Ponyboy have to go into hiding. This classic truly transcends time. The gang issues and social class differences are just as relevant today as they were 50 years ago. 5 stars!! It was superb, and you should definitely put it on your TBR!